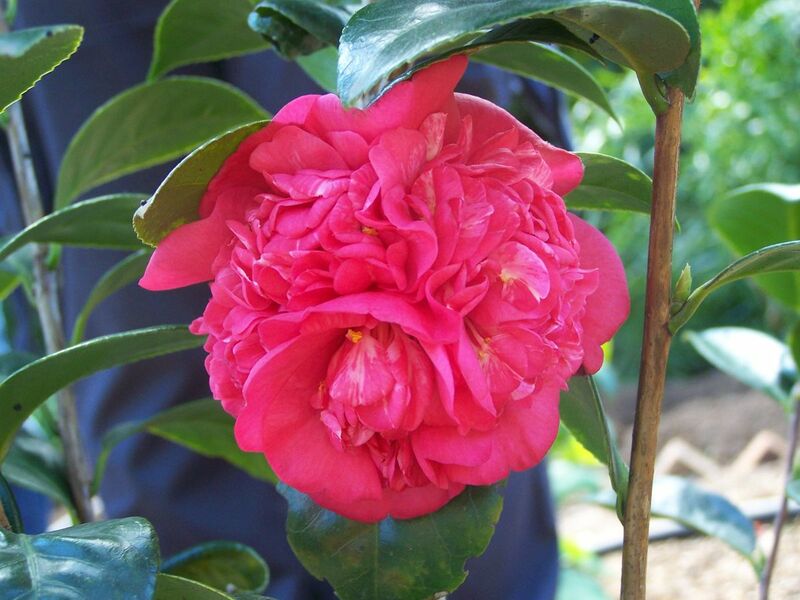 A cultivar of Camellia japonica L. Camden Park bred, seedling 41/51. ‘Bright crimson, excessively double, petals very numerous, arranged round several distinct centres like several double flowers attached together. Very good.’ William Macarthur. [MP A2948-6]. An unnamed cultivar at Camden Park, #4 at the Old Orchard, now part of the Elizabeth Macarthur Agricultural Institute, is a very close match for William's ‘Juno’. The flowers are large, anemony-form, very double, almost globular when full blown, and bright crimson in colour (RHS Colour Chart 52A—Crimson). Many show what appear to be multiple centres exactly as described by William. Some petals show white streaking, not mentioned by William, but this varies between flowers. The flowers have stamens scattered among the petals and several stigmas in the centre. It is an upright grower, very vigorous and easily propagated from cuttings. Another possibility is 'Pallas', described by William Macarthur as ‘Dark bright crimson, very double with several centres like Juno, quite irregular. Good.’ [MP A2948-6]. First described in 1851, ‘Juno’ is not listed in the 1857 catalogue.